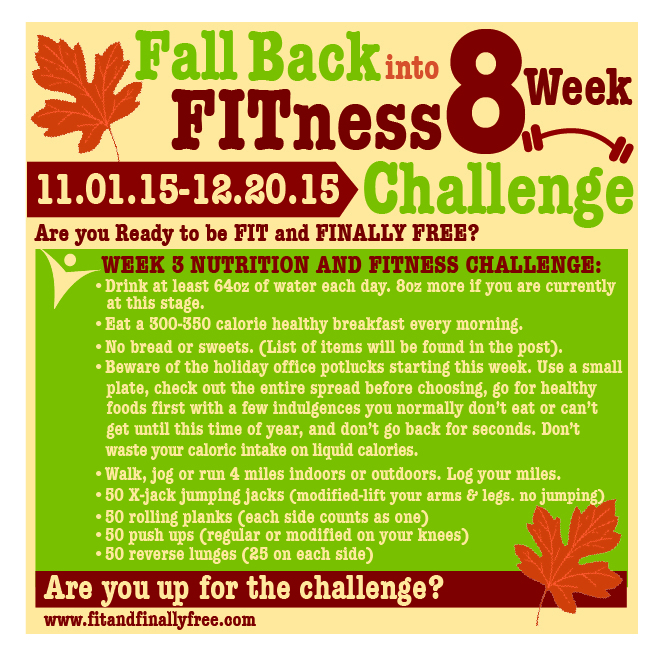 Today, marks week 3 of our Fall Back into Fitness 8 Week Challenge. Thanks to all who are sticking with the challenge and welcome to our newcomers. You’ll find the rules of the challenge on November 1st week one’s post. With Thanksgiving approaching, I stepped up our nutrition and fitness challenge this week by eliminating some food items I know you will be indulging in next week and to spearhead any weight that might be gained. I’m keeping my fingers crossed that there won’t be any or it will be at a minimum because you will still be getting some form of exercise in next week. As usual, I will post videos on how to properly perform the exercises. Please use your personal judgment and modify them if need be, but don’t modify them if you don’t have to. Any form of cornbread, any kind of bread, flat bread, pitas, naan, any form of crackers, pancakes, waffles, crepes, biscuits, English muffins, wraps, cookies, pastries, muffins, cupcakes, pies, scones, ice cream, frozen yogurt, popsicles, fruit bars, sherbert, donuts, cakes, honeybuns, tarts, brownies, and crumpets. I’m sure I probably missed different forms of breads and sweets, but I think I’ve covered most of it. Ask questions if you are unsure of something before you eat it. I will also post some tips on how to not overindulge at the holiday office potlucks and party gatherings. Let’s make a sacrifice this week so you can eat a little next week. Always approach the holidays with an action plan in hand. I’m looking forward to reading your posts and seeing your workouts. Have a FITabulous week! Live and Be Well! Next postDon’t Gobble until you Wobble!